• 90 Ton Cincinnati Model 90CBX 8' - 10' O.A.-8'6" B.H. • 90 Ton Verson Mechanical Press Brake - 8' O.A.-6'6" B.H. • 220 Ton Hydraulic Press Brake - 11' O.A.-10'6" B.H. 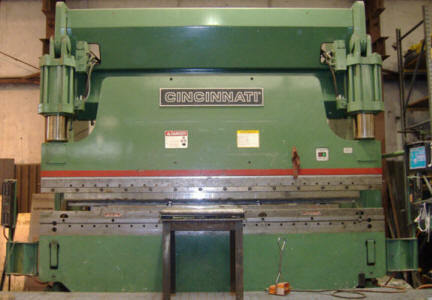 • 350 Ton Cincinnati Proform Press Brake - 14' O.A. - 12'6" B.H. • Ercolina Mega Bender - non mandrel and mandrel pipe, tube and profile bending. Bends 1/4" to 3" diameters. Bend angle range 0 to 180 degrees.